Jury of Peers: Who are Loyolans? Investors, entrepreneurs, actors, bankers, models, paralegals, yoga instructors, musicians, philanthropists, volunteers, and lobbyists. The Loyola Law School student body is comprised of all of these individuals and many, many more. I’m always amazed to find out what my classmates do when not learning about the law. They’re going to “pilot season” auditions, organizing care packages for the homeless, re-vamping worn-down properties, negotiating deals, and the list goes on. I do my best to keep up with this ambitious crowd. My own extracurricular passion is dog rescue. It all began during an evening walk through a community park in Iasi, Romania, the city where I lived, in 2010. I was already well aware of a stray dog problem in the country, but I felt I could do little, if anything, to help. I was raising an infant son, my husband was wrapping up his studies in dental medicine, and we lived in a cozy one-bedroom unit within a communist-era residential building. But on that life-changing evening, I happened upon two tiny puppies, sitting alone at the park next to a bench. We sat down on the bench and waited to see if their mother would come back. We waited for so long that the puppies eventually curled up on our feet and fell asleep. How they tugged at my heartstrings! I couldn’t leave them alone to freeze through the night, so I informed my husband that we were taking the puppies home. My husband knew better than to disagree with a woman on a mission, so he obliged. 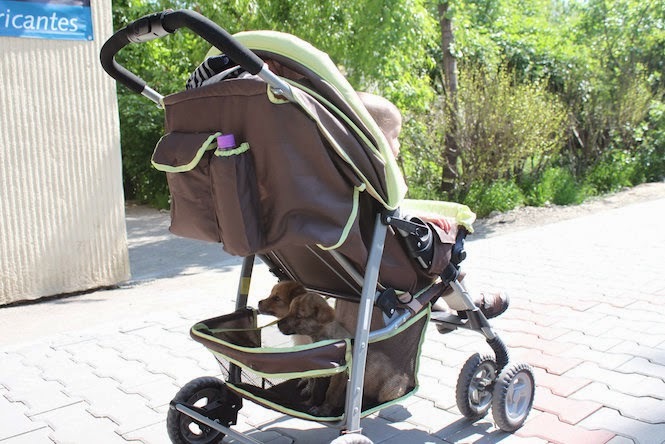 I placed the puppies in the open bottom storage compartment of my son’s stroller and brought them home. With no pet supplies whatsoever, I had to simply set some newspapers in a cardboard box for the night, and that’s where the puppies slept. Their sleeping quarters eventually upgraded to the bathtub, which I covered with a rug. When resources are limited, you have to improvise! At the vet the next day, the puppies received some flea/tick-controlling drops, vaccinations, and de-worming pills. Fortunately for everyone, the de-worming phase was short-lived. The housebreaking stage was slightly more complicated, since I refused to allow the puppies back out on the street, not knowing what kind of diseases they could become infected with since they no longer received any maternal antibodies and since they had not completed the full course of vaccinations either. So, it was complicated. If I ever left home with the puppies, I had to carry them around in a bag. It was quite the spectacle—especially for the locals. Never had they ever seen an Asian American woman tote two little street mutts around with the pups’ heads poking out of a handbag, while also pushing a baby around in a stroller. 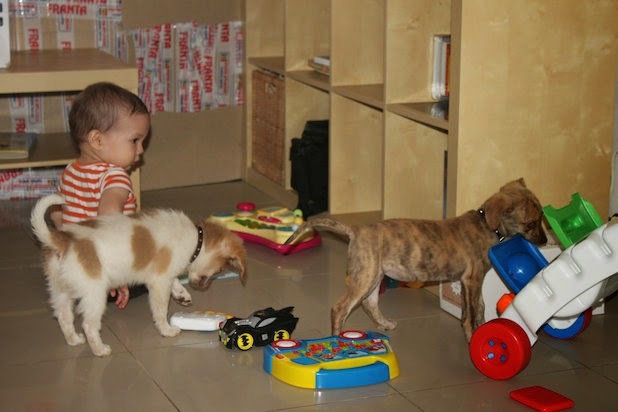 My son actually learned how to crawl and walk while dodging these puppies. They were the cutest sight to behold, the little trio. They essentially became part of the family. Thus, I fantasized about taking the puppies back to Los Angeles with me, but realized it wouldn’t be possible, since I would have to move back in with my parents until I found a place of my own. Releasing the puppies back onto the streets was, of course, not an option. Finding them a home in the neighborhood wasn’t an option either, since I was pretty certain they would wind up on the streets eventually—mutts of stray origins just aren’t generally accepted as household pets over there. So, I performed an online search and found out about Nancy Janes, the founder of Romania Animal Rescue, Inc. I discovered that Nancy, a native Californian, established the non-profit group after visiting Romania for a backpacking trip. Upon arrival, she gave up the backpacking tour in favor of feeding the stray dogs. 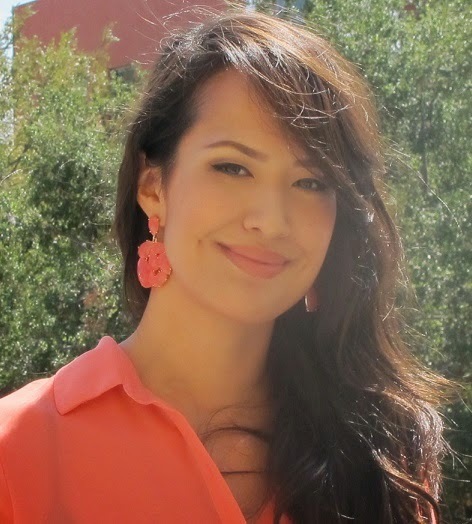 The problem impacted her so much that she came home and went to work setting up an organization to help. Since the group’s inception, Nancy has had numerous Romanian vets trained and has funded spay/neuter operations for countless Romanian dogs. I called Nancy up and told her about my two puppies, and she immediately went to work putting me in touch with local rescue groups. I was connected with Treue Pfoetchen (TP), a German rescue group that routinely pulled dogs out of Romania for adoption in Germany. TP agreed to take my puppies before I departed for Los Angeles. They put me in touch with one of their regular foster homes in Bucharest, the capitol city, where the puppies would stay until a van would pick them up for the road trip to Germany. So, I packed my bags and my husband drove me from Iasi to Bucharest, a trip that lasted about 6 hours. The puppies sat on my lap for the duration of the drive, since I didn’t have a crate to put them in. The poor things were totally unaccustomed to vehicles, so they got carsick and vomited on my lap numerous times. I think I have since burned the skirt I was wearing that day. Once in Bucharest, we dropped the puppies off at their foster home. I boarded a flight back to Los Angeles, while my husband drove back to Iasi to finish his exams. Back in L.A., I revisited the TP website and found photos of my puppies safe and sound in Germany. Elated, I knew that wasn’t the last time I would rescue dogs. In fact, on March 11, 2014, I had the pleasure of welcoming four Romanian street dogs to Los Angeles. It was an incredible rescue that came together as a result of amazing teamwork, as well as some generous donations of course. 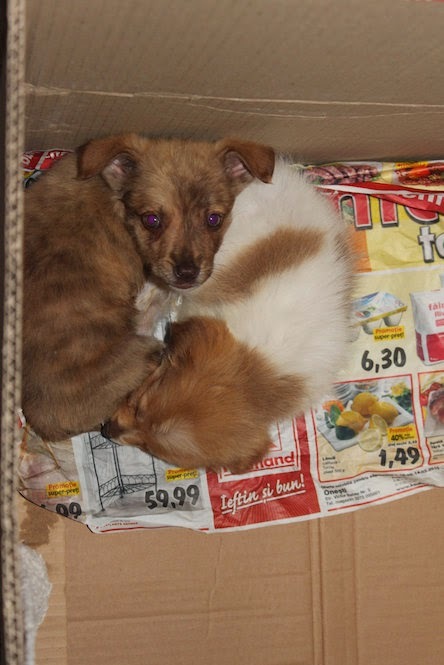 But with that teaser, I will conclude this post—stay tuned for more on the “Romanian Puppy Rescue Mission”! Who are Loyolans? Add international dog rescuer to that list.